c1947. Inland Revenue key type of Eritrea surcharged “CYRENAICA P.T. 25” in bold sans-serif type, the original value deleted with four bars across the whole stamp. Note: earliest recorded example – 15th January 1947 (C2). Erler gives the date of issue as 1946. 1950. Postage stamps of Cyrenaica (Mujahid design) used fiscally. Perf 12½. No wmk. Printed (recess) by Waterlow. Note: for ease of reference, the numbering of this issue follows the Stanley Gibbons Part 1 (Commonwealth / British Empire) catalogue. Currency: 100 centesimi = 1 lira (plural lire). The Italian lira was replaced by the Military Administration Lira shortly after power was handed over to the British. Note: Erler designates #1-27 of the following issues as 'Libya', ie valid for use in Cyrenaica as well as Tripolitania. I regard them as Tripolitania issues since they are denominated in MAL while Cyrenaica seems to have used Egyptian currency. Cyrenaica documents from the relevant period might confirm this but I have not seen any. King Victor Emmanuel revenues (large and small formats) overprinted or surcharged also. Watermark Single Crown (small format) or Two Crowns sideways (large formats), pointing to right as seen from the back of the stamp. Perf 14.
c1946. Overprinted “B.M.A.” (= British Military Administration) and value in seriffed letters 2mm high. Notes: earliest recorded use – 18th May 1948 (T7), 30th May 1948 (T5), 21st September 1948 (T6), 18th November 1949 (T1). Latest recorded use – 29th January 1951 (T9). 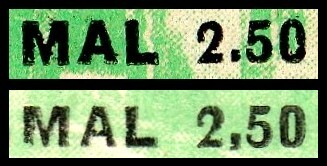 Erler gives an issue date of 1945 for the stamps with seriffed overprint, and 1948 for the bold sans-serif (T11-18 and T21-27 below). 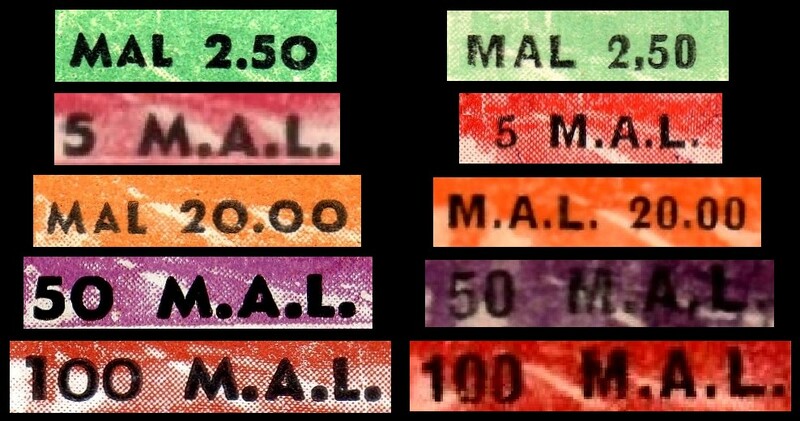 The small format stamps can be found with the letters 'BMA' shaved at top. This has been recorded on the 50c, 2l, 10l and 40l and may exist on all values. Notes: earliest recorded use – 21st September 1948 (T12), 1948 (T15), 23rd March 1949 (T17). Notes: earliest recorded use - 29th January 1951 (T26). Latest recorded use – 8th October 1951 (T26). The change of overprint from “B.M.A.” to “B.Adm.T.” shows that this set was issued after the British Military Administration was replaced with a civil British administration in 1950. Notes: no dated examples of this issue have so far been recorded. 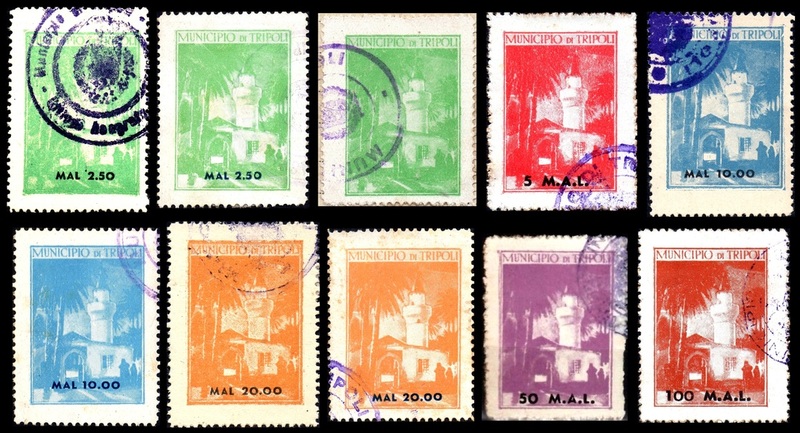 Erler gives an issue date of 1946, but the fact that the new overprint does not refer to British administration may indicate that this set and the next were issued after Libya became independent in 1951. They are retained at this point in my listing because of their similarity to the preceding issues. c1951. 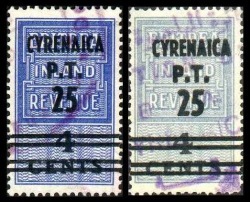 Postage stamps of Cyrenaica (1950 issue, currency in Egyptian millièmes) surcharged “Tripolitania REVENUE [value] MAL” in Arabic and in English bold sans-serif letters 2mm high. Surcharge in black (10l) or red. Notes: no dated examples of this issue have so far been recorded. Erler states that the overprint was in red on all four values, though the 10l on 3m with red overprint is not attested anywhere else. 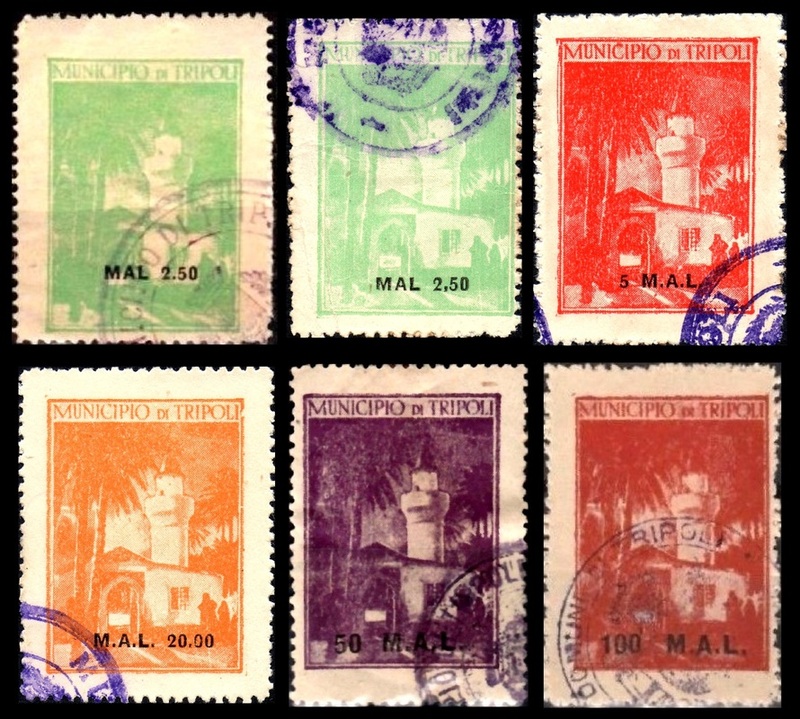 Note: stamps of the types shown here are listed by Erler as issues for Libya (left) and Tripoli municipal (right), both with an issue date of 1950, ie during the British administration. I have not seen any evidence to suggest that they were issued before Libya's independence in 1951, so they are listed under Kingdom regional issues. c1946. Italian revenues inscribed Tassa di Bollo per Cambiali (= Bill of Exchange Stamp Duty) and overprinted A.O.I. (= Africa Orientale Italiana, Italian East Africa) now further overprinted B.M.A. (= British Military Administration) in bold sans-serif letters for use in Tripolitania. 1. B6, B7, B9 and B11 have an additional overprint consisting of wavy diagonal lines across the corners of the stamp. 2. Erler additionally lists the 10c red, 1l pale violet, 4l violet and 30l red & light blue, but I have not seen these values. 1946. Insurance stamps. Overprinted INPS and new value in Military Administration Lire. 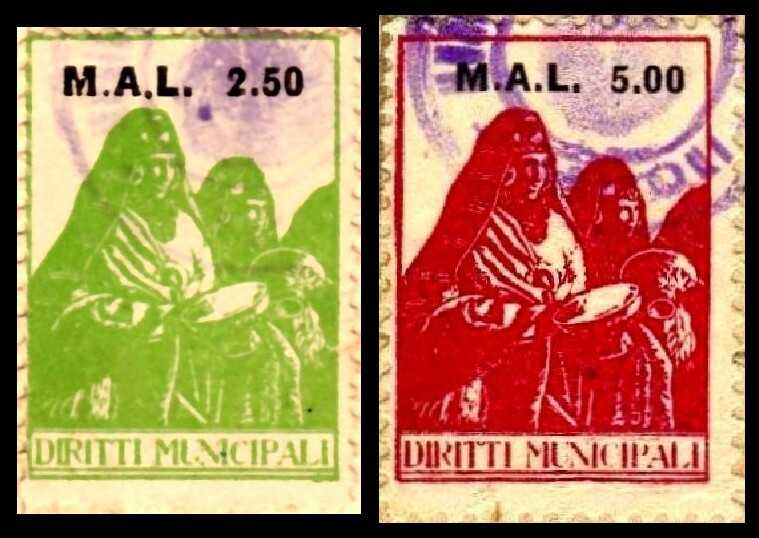 With the overprint INPS and a currency in Military Administration Lire, these stamps would almost certainly be Social Security issues for Tripolitania under British Occupation or from the early days after Independence. I have never seen them or any reference to them other than in Erler. If any reader can supply images of these stamps, I would be very grateful. ​c1945. 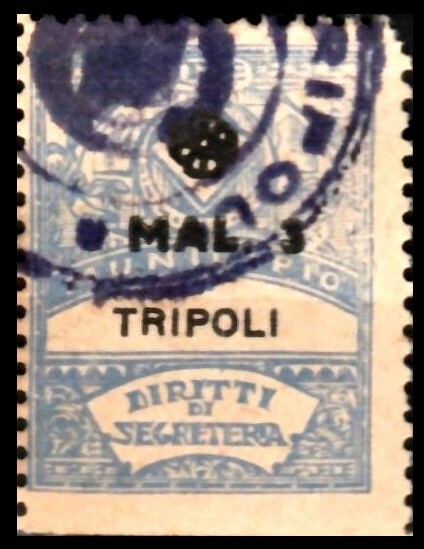 Pre-war municipal inscribed MUNICIPIO DI TRIPOLI DIRITTI DI SEGRETARIA, surcharged in Military Administration Lire with floral motif cancelling original figures of value. 1945 (recorded usage). Local musicians. 19½ x 28 mm. Inscribed DIRITTI MUNICIPALI, surcharged in black, M.A.L. 2 mm tall with full stops. No watermark. Perf 11½. 1945-52 (recorded usage). Zawiya Mosque, Tripoli. 25 x 35 mm. Inscribed MUNICIPIO DI TRIPOLI. No watermark. Perf 11½. Two different types of MAL surcharge. 1. In both a) and b) types of surcharge, the 2.50l, 10l, 20l all have figures of value after MAL and zeroes after the decimal point (MAL 10.00 etc), while the 5l, 50l and 100l have figures of value before MAL and no decimal point or zeroes (5 M.A.L. etc). 2. The only clue to the sheet format for these issues is the tête-bêche block of four of M14a illustrated below right. This suggests that at least some rows in the sheet were printed inverted relative to the others.